Be the first to share your favorite memory, photo or story of Traci. This memorial page is dedicated for family, friends and future generations to celebrate the life of their loved one. 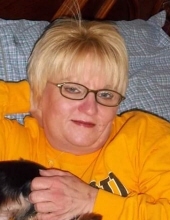 Traci Dawn Coffman, 53, of Auxvasse passed away at her home on Sunday, January 27, 2019. Those remaining to cherish her memory include daughter, Caroline “Carli” Coffman of Auxvasse; mother, Linda Klick of Auxvasse; sister, Jennifer Moore of Auxvasse; nieces, Paige Brewer (Curtis) Akron, Oh., and Cassidy Moore of Auxvasse; great niece, Blakely Brewer of Akron, Oh. ; and grandcat, Bash. A memorial service will be held at 6:00 p.m. on Monday, February 4, 2019 at Auxvasse Presbyterian Church with Pastor Jim Graham officiating. Friends will be received from 5:00 p.m. until the time of service at the church. To send flowers or a remembrance gift to the family of Traci Dawn Coffman, please visit our Tribute Store. "Email Address" would like to share the life celebration of Traci Dawn Coffman. Click on the "link" to go to share a favorite memory or leave a condolence message for the family.